Last weekend, a powerful thunderstorm whipping through caused me to exit the town I was visiting at an enhanced pace, because the winds were gusting up to about sixty miles an hour and seriously rocking my car as I began to eat the fried chicken I’d just bought – at the only decent independent fried chicken place in forty miles, I’ll mention here, not a KFC. I wanted to move on primarily because there were several large trees surrounding my car, which I prefer in its current unflattened shape. I high-tailed it out of there and drove closer to home to continue my meal. The storm ended up coming through the car park I paused at, with the same alarmingly high winds, close lightning every few seconds, and a torrential downpour that dropped visibility to about a hundred fifty feet, all of which reminded me strongly of the sort of pop-up thunderstorm often seen in Atlanta on summer afternoons. When you’re on the highway there and that happens, everyone immediately slows to about 20 mph and puts their emergency flashers on. 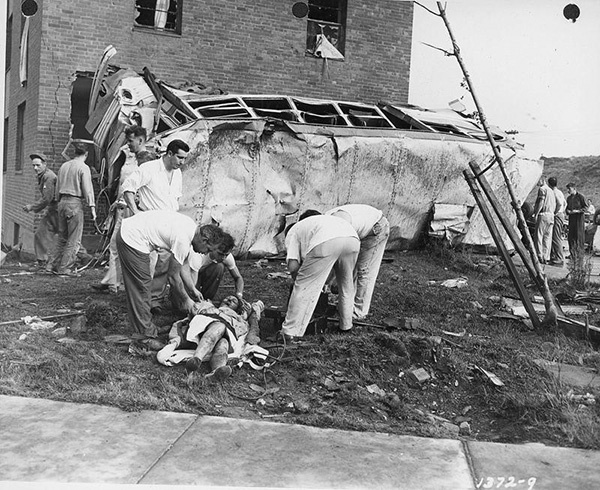 The Revere tornado touched down for about a quarter-mile and caused millions in damage, but probably short of the US$9.1m threshold before federal aid can kick in. After the worst of the storm passed through and continued toward where I live, I flipped my phone sideways in its pillar mount and turned the camera on in case it might catch something interesting, which it did. 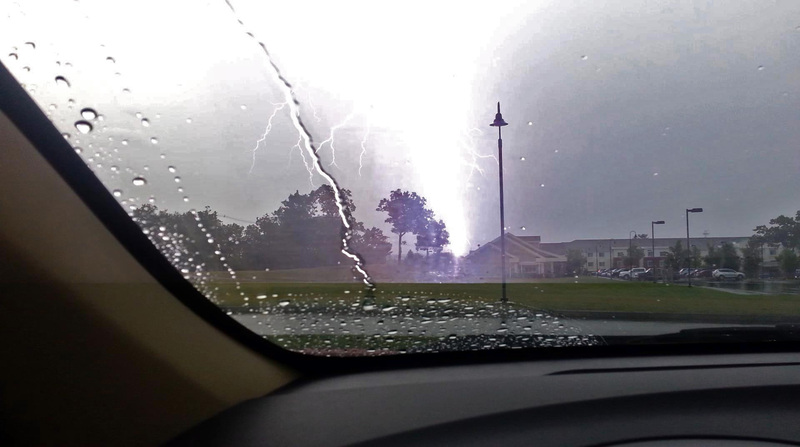 When I saw this particular lightning strike, the best of several I caught on the 15-minute video, I thought, “Say, that looks pretty close to my house.” Sure enough, it was: Power was out when I got home and remained off for three hours whilst National Grid repaired whatever got hit. Here’s the history of tornadoes in Massachusetts since 1950, from the Tornado History Project. The digit is the Fujita scale number for each. The red 4 in the middle represents the worst one that’s occurred here, the Worcester tornado of 9 June 1953, which killed 93 people and injured 1,228. This bus had people in it when the Worcester tornado picked it up and slammed it against a building. Two people on the bus died. 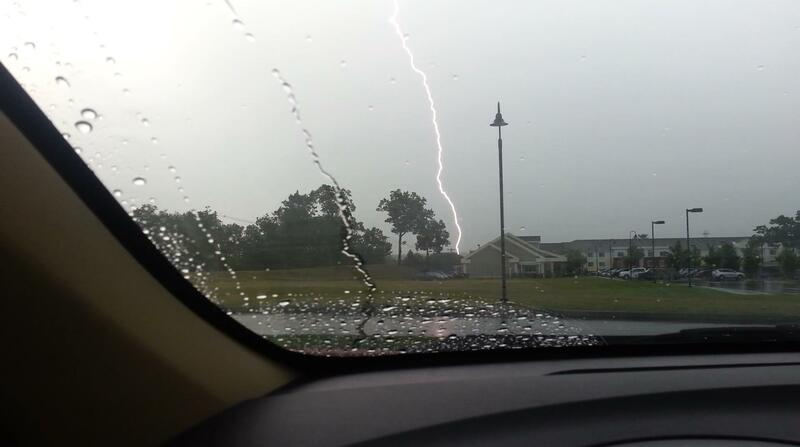 This entry was posted in Weather and tagged lightning, Massachusetts, Tornado.